Congratulations to Whitney, the winner of Cynthia's giveaway. Thank you to all who participated. One of the coolest parts of writing romantic suspense is getting the opportunity to explore dastardly villains. I love creating bad guys that are both ruthless and human, finding that one redeeming trait that I can exploit to add layer and depth to their madness. When I first started writing EDGE OF LIGHT, I immediately realized I had a problem. Because I didn't just have one villain. I had three. And each villain needed his own point of view. I questioned my sanity trying to juggle three villains, one secondary character AND the hero and heroine. I worried that maybe readers wouldn't want to spend that much time getting into my villains' heads. And maybe they won't...guess I'll soon find out! But, the more I wrote, the more I realized the importance of the dynamic between these three men. Jude, The Father, is the unequivocal leader. Chann, The Son, is the false missionary among the Cambodian tribes, and Leo, The Unholy Ghost, is the ruthless albino forced into doing the “dirty” work. Together, they make up The Trinity, three men united under a common goal—total anarchy. I loved being able to show how their motivations changed over time. Their downfall doesn't only come because Jocelyn and Oliver are fighting for their freedom, it also comes from within. Getting into each of their heads allowed me to really delve into the friction that destroys them and make use of the symbolism surrounding The Trinity. So, as I'm plotting my next romantic suspense and getting into the villain frame of mind, who are some of your favorite villains? They can be from books, movies, TV, whatever. Do they have any redeeming qualities? Everyone who leaves me a comment will be entered to win a digital copy of EDGE OF LIGHT. Taken prisoner by a ruthless group of anarchists deep in the Cambodian jungle, anthropologist Jocelyn Hewitt is isolated in a dark prison cell. Without chance of rescue. Or hope. Until the man in the next cell reaches out to let her know she’s not as alone as she thinks. Jocelyn’s heart aches for the tortured man whose presence and voice give her the courage to risk their escape. But first she’ll have to remind Oliver who he once was, what he once loved, and bring him back to life. Only then will they have a chance for freedom—and the kind of love neither ever thought possible. Cynthia is a former Romance Writers of America Golden Heart® Finalist in Romantic Suspense. She started out writing contemporary romance, but when all her plots began to turn dastardly, she decided to stop fighting the urge to throw explosions, dead bodies, and evil villains into her books. With her B.S. in the chemical sciences and her love of the periodic table (yes, she’s a geek and proud of it!) she finally found the perfect potent mix of love and danger to put into her stories. Cynthia lives in Arizona with her real life hero husband and their two sons. Visit her website. Follow her on Twitter and find her on Facebook. 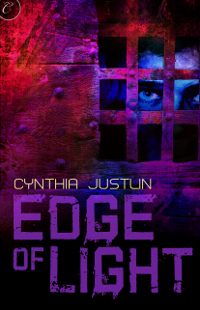 Cynthia will be awarding one lucky commenter a digital copy of EDGE OF LIGHT. Giveaway ends 10pm EST May 17th. Please supply your email in the post. You may use spaces or full text for security. (ex. jsmith at gmail dot com) If you do not wish to supply your email, or have trouble posting, please email justromanticsuspense @ gmail.com with a subject title of JRS GIVEAWAY to be entered in the current giveaway. Three villains are indeed a lot to manage. The blurb sounds great and I'm adding this to my TBR! @TrishJ -- I love a villain that plays mind games. Ruthless is one thing. Ruthless AND a psychological predator is absolutely chilling. @Jennifer Lane -- Three villains was a lot to manage, but I really loved getting into their heads and finding out what made them tick! @Anonymous (Tammy) -- Thanks so much! Villains ARE fascinating characters. I find that there is a lot of information on the hero but very little on what makes a good villain. Of course Hannibal Lecter is THE villain. I find that Dean R Koontz has some "good" ones too. Please enter me in your draw. I would very much like to read it. Farrah Rochon tweeted about the giveaway and after reading the synopsis, I look forward to reading the book. My e-mail address is jen.eliz68 at gmail dot com. This book sound great. Looking forward to read some of your works. Looking forward to reading the book! My epic TBR queue grows once again. Darth Vader is my villains. You just can't hate him. After all he is Luke Skywalker's father. There has to be some good in him. Three villans? Sounds fantastic, as does your blurb. Hmm, favorite villans. Hannibal Lector is one I love. Three dimensional and the kind you can't help but root for. Dexter is another, although I'm not sure he qualifies as a real villan. Even so, he's an incredibly dark and well-rounded character. I'd have to go w/ Darth Vadar as the ultimate villain. @Janet -- Yes! Dean Koontz does have some fabulous villains! I've been a Koontz fan for years. LOVE his book LIGHTNING! @myromancelandia & @bn100 -- Thanks for stopping by! @Cris -- Hannibal Lecter is such a complex, terrifying villain! @Kai -- Darth Vader is definitely a good example of a villain with some redeeming qualities! @Stacy -- Thanks! Dexter is one of those straddle the lines between good and evil characters. That's what makes him so interesting. @erin -- Thanks! And another fan of Darth Vader! Yay! @Whitney -- Great point about the really evil villains being the ones who can walk among us undetected. And Casanova is a fabulous example of that. Thanks! An exotic male dancer, really? rofl NICE! RT @CarinaPress: . @cynthiajustlin married a former exotic male dancer. And, no, that's not how she met him. Villians... Lex Luther for Superman, I have also enjoyed quite a few of the villians in Catherine Coulter's FBI books and Some from JD Robb's In Death series... Thank you for sharing with us!